Whenever I chat to people about their travels, I am inspired of new places to go to. “Yes, I’ve just gotten back from Croatia”, they say. ‘Oooh, Croatia is on “my list”‘, I think. “Mmm, I just spent last month in Canada”, they say. ‘Yep, Canada is definitely on “the list”‘, I think. My mental list is getting too long. In my desire to finish uni, I’m filling it up with useless rubbish (who really needs to know about partial differential equations?!) and forgetting important things – and so I have created this page, my wish list of places to go. I’ll be adding to it as I think of new places/am inspired by others’ travels. And I’ll be updating it after I’ve been to some of these places, with my thoughts and opinions. This list is mainly for me – so I can keep tabs on where I want to go, but it’s also for others, looking for some travel inspiration. Enjoy! A village that spends most of the year in high waters, and so the majority of the houses are on stilts for most of the year. Transport is primarily boat. About 30 years ago, a farmer who was digging a well found some statues buried in the ground. Come feel it was the greatest archeoligical find of the 20th century. 3 Large pits of terricotta statues have been uncovered, it is thought that there could be more, not yet discovered. The biggest pit is thought to contain over 6000 peices, including soldiers, horses, carts and weapons. They are believed to have been built over 2000 years ago, although there is some dispute over that. Falling asleep on a rocking train is one of the best experiences. Overnight trains give you the opportunity to meet new people, take some ‘time-out’, get a great nights sleep and save money on accommodation! The Panda Park is huge, and you can cuddle the pandas! The best bit is the nursery though – how cute can a panda get?! Fantastically beautiful mountains in the middle of China – these are most likely the mountains that feature on any of the old postcards you’ve seen of China. Good luck with the climb down though! Beautiful beaches, most with lifeguards – just remember the sunscreen! Truly impressive. 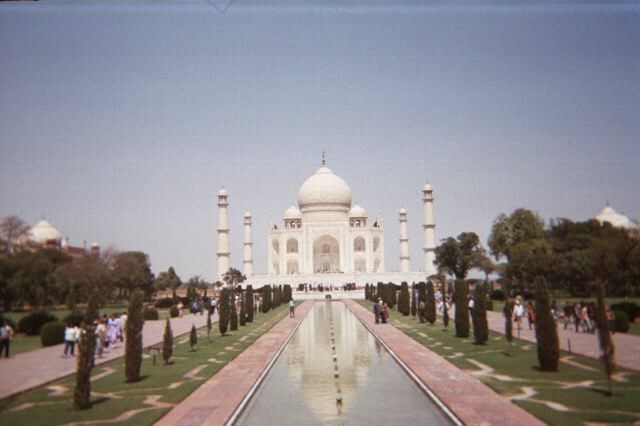 The Taj Mahal was built by Shah Jahan for his wife, Mumtaz Mahal. It is basically a tomb. When she died giving birth to their fourteenth child, he was so distraught that he ordered it to be built (with the tax-payers money!). It took 20,000 workers 22 years to finish. This is just one of those sights that needs to be seen. We passed all the famous ghats (stairs next to the river). One of the more interesting ones was the cremation ghat, where we saw a couple of cremations taking place. Right in front of everyone they had the fires going, you could see everything. Its just a way of life I guess. Also known as the rat temple, rats crawling all over our (bare) feet is an experience I’m unlikely to forget. We even saw a white rat, supposed to bring good luck. In eastern Hokkaido, home to the cute ‘marimo’, a type of endangered algae that normally grows on the bottom of lakes, but floats to the top in sunshine – creating a radiant green colour. The symbol of Japan, although I didn’t climb it, I spent 5 days in the foothills, lazing about in green grassy parks with Mt Fuji in the background. To see Awa Odori, August 12th to 15th, HUGE dance festival, loads of people dressed in their yukatas dancing in the street. Get a glimpse of long-held traditions of Japanese religious life by staying in a temple – I did so at Koya-San. A bit of a trek to get there, but a fantastic experience (particularly if it’s your last night in Japan! Walk through a smoldering volcano that erupted just a few years ago (2000) and then nearby see a volcano that is still smoldering but that rose to its current height in just a year during WWII. Incredible experience, hotel full of small ‘capsule’ like rooms – tiny boxes really – one of the more unusual hotels available! National sport of Japan (other than baseball, that is :)), not a great fan, but I figure it’s on the list of must see’s for Japan! Electronic dictionaries, digital cameras, mp3 players, rice cookers, even eletronic toilets! Also known for the ’10 hells’, multicolored volcanic pits of boiling water and mud, and one geyser, Beppu boasts the Takegawara Onsen, which has hot sand ‘onsen’. The experience of being in a sand onsen cannot be described, quite possibly one of my most calming experiences ever. A remote island off the coast of Taiwan, perhaps go diving? The backpacker center of Bangkok, Khao San Road is a bit of fun, provided you don’t pay too much attention to much! Almost a rite of passage for backpackers, I had my hair plaited with purple extensions on my first trip to Thailand. An experience not to be missed – particularly that first night a couple of months later when we finally took out the plaits! Snorkeling in Maya Bay – an experience I’ll never forget. Beautiful tropical fish everywhere, nibbling on the ends of your hair, amazing. At the elephant camp, just out of Lampang – apparently the only place in thailand where elephants are actually trained, there are lots of parks around thailand, but they are just show cases for tourists. We saw a show on what the elephants are trained to do, mainly to do with logging.